Andrew Ramsay and Cocq A Doodle. Photo Credit ©Sportfot. Mill Spring, NC – July 15, 2017 – Andrew Ramsay (USA) and Cocq A Doddle earned the victory in the $86,000 Tryon Resort Grand Prix CSI 2*, stopping the timers in an impressive 35.819 seconds at the Tryon International Equestrian Center (TIEC), in the final international grand prix of the 2017 Tryon Summer Series. Following closely behind was Marilyn Little (USA) and Clearwater with a time of 36.343 seconds to earn second place honors, while Kristen Vanderveen (USA) and her trusted mount, Bull Run’s Faustino De Tili, took home the third place position with a time of 36.565 seconds. 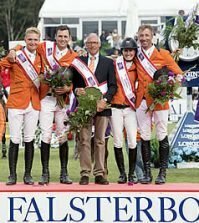 The anticipated highlight class of the week at TIEC boasted 54 total entries, and saw sixteen of those return to test their abilities around the jump-off track set by Martin Otto (GER), who was the course designer. Ramsay had two horses qualified for the jump-off, the other being California 62, who finished in the fifth place position. Cocq A Doodle, a 2007 Belgian Warmblood mare (Tolan R x Niagara) owned by The Doodle Group, and Ramsay have been partnered for the past year and a half, securing multiple top placings across the country before landing the big win at TIEC. “We have spent the past year just developing her and moving her up and she has been fantastic,” he commented. “Doodle is a very explosive horse and she has a lot of power. After the first three fences in the jump-off tonight, I kind of got a shot of adrenaline like ‘I’m on it! I’m on it!’ and it keeps you going,” Ramsey added with a laugh. “Heading to the last fence she just picked up a full gallop and luckily she backed herself up and it worked out for us tonight,” he concluded. The week marked Ramsay’s final time competing at TIEC this summer and he elaborated on the convenience of the facility as a whole and his happiness with the victory. Amanda Derbyshire (GBR) earned the FEI Leading Lady Jumper Rider Award presented by Meg Atkinston of Town & Country Realtors in recognition of her performances in international competition throughout the week. To learn more about Tryon International Equestrian Center (TIEC), please visit www.tryon.com.